As sunlight grows shorter and the air begins to crisp, it's natural to think about the coming winter ahead. The Farmer's Almanac forewarns that this winter will be exceptionally cold, if not downright frigid. Before we get there though, there are few steps you can take to make your house more comfortable this year. Call the right pro. 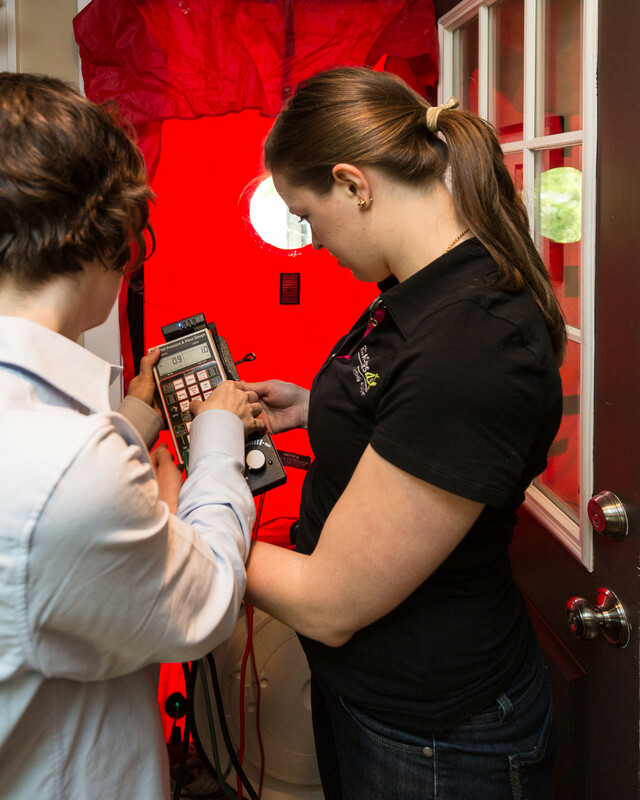 Look for someone that does blower door tests and has an infrared camera. Many people naturally think old windows are where most of the cold drafts come in and where your energy dollars go out. However, this usually is among the least severe issues. More likely, there are large holes you haven't thought of where the air is really coming in: that scary attic, creepy crawlspace, or some other part of your home that's not frequently visited. A home performance professional is trained to evaluate the building as a complete system, rather than looking at only one aspect, like HVAC equipment or windows. Air sealing is your friend. Once your blower door test is done and the leakage spots are revealed, grab that caulk or expanding foam and go to town. Not sure what to use? The size of the gap should guide you. For small seams (such as cracks around your windows), regular caulk comes in handy. You can even get the kind that comes out white for visibility, but then dries clear. If you've got slightly larger gaps in a visible space, cut foam tubing known as backer rod, stuff it in, and caulk the outside seam. For large gaps in more structural places, like exposed basement ceiling cavities (rim/band joist), expanding foam will be your best bet as it covers the most surface area. These measures can be a little tricky at first, so check out an online weatherization video or article to prepare. Seal the HVAC ducts! Did you know that a typical forced air system has between 25-35% leakage? That means a significant amount of heat is lost before it even makes it to the registers in your bedroom. No wonder the whole family is wearing snuggies! By sealing seams around ductwork joints, caulking register boot intersections (where the sheet metal ducts meet drywall or floor boards), and putting tape or mastic near the air handlers, you'll help your furnace's air reach the areas where you really want it. For more complex jobs, look into aero-sealing for existing ductwork that's covered by walls, ceilings, and floors. Scent in moderation. Holidays are a popular time for smelly stuff, whether it's a burning candle, deodorizing spray, or a plug-in air freshener. Before using these products, be aware that they could be full of harmful VOCs. Consider cracking a window or opening a door to help mix fresh air into the room. Replace those air filters. It may not be the most glamorous of jobs, but changing your furnace air filter helps your HVAC system perform like a rock star - especially since you'll be spending more time indoors as the temperatures drop. As a bonus, you'll improve your home's air quality. Put a reminder on your calendar for every 3-4 months, although it could be more or less depending on your personal needs. Fun Autumn Tip: Did you know spiders can be nature's energy auditor? Where you see them setting up webs is usually where they see other insects coming in from outside. They're setting their webs in high-traffic locations, and these are the same places where we typically see air leaks with our blower door equipment. Getting your home tested and diagnosed will show you the easy paths bugs take, and getting your home air sealed will have the benefits of reducing insect infiltration as well as air infiltration! Fundamentally, we want to have more control of our building, and controlling air flow is the easiest way to have a big impact. By doing so, we'll also control moisture flow, as well as insect flow, heat flow, and vapor flow. Solving home performance is a tricky business, but with the right experts, you can enjoy winter in a cozy home with less unwanted guests. Find local pros and learn more at RESNET.